Can I get a wooden Barbie doll house with large rooms for wooden furniture? Is there someone out there who makes houses such as these? Probably your best idea would be to obtain a plan. Or some more ideas from books and online resources. Then with this info in hand find someone local with talent to help you construct what you want. Them being in your local area will dramatically reduce the costs of your structure. Freight costs will be non-existent this way. It could be a process to find someone. However that can be all part of the adventure. If you think in terms of this process as an adventure you will have fun. Actually I would start with people I knew were into woodworking projects of any kind. Those are the people who may love to do what you want done. Be of course ready to pay them for their services. No one wants to work away at something for free. Usually they do not. Remember their time is as valuable as the dollhouse you want created. Do your research before you approach someone. Then you will be able to tell them exactly how you see this structure coming together. This link needs to be copied and pasted into your web browser. 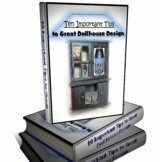 The house illustrated is for fashion dolls and is one I have admired for years. Would love to put it on my dollhouse to do list for sure. Want to Help Carole Mraz?